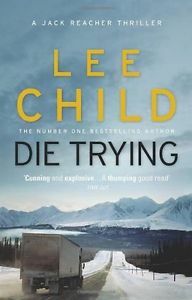 Die Trying, a novel featuring Major Jack Reacher, written by Lee Child. Lee Child’s second novel, Die Trying, was published in 1998 featured Jack Reacher, centre stage, once more. Whilst working as a doorman in Chicago Reacher becomes caught-up in the kidnapping of Holly Johnson, an FBI agent. She is also the daughter of a US Army general who is serving as the Chairman of the Joint Chiefs of Staff. They are both bundled into a truck and driven across the States for a reason and to a location unknown to them. Holly’s FBI colleagues take some time to notice her missing but then begin to try to piece together her movements and what has happened to her. Reacher and Holly find on arrival in a remote part of Montana that they are being held by the Montana Militia, whose leader is Beau Borken. The intricate plot involves not only an FBI mole in the militia who has infiltrated them, but also a traitor within the FBI who supplies Borken information. The President, fearful of another Waco type media catastrophe, does not want an outright assault and wishes the matter to be handled sensitively and carefully by the FBI and Army. The novel is very well plotted and has the ability to keep the reader hooked and guessing. Lee Child is a true master of his craft. I found the novel immensely difficult to put down. The Jack Reacher character, first introduced by Lee Child in Killing Floor, is sure to become an enduring hero in the mould of James Bond.